Somewhere in my bookshelf there is a well worn copy of Helene Hanff’s best seller 84 Charing Cross Road, documenting a trans-Atlantic correspondence that verged on a love affair between the New York based author and one Frank Doel, manager of an antiquarian bookshop in London. The title is the address of the shop, a place which, much to Hanff’s delight, happened to stock cheap but good quality second-hand books, the likes of which she found impossible to get her hands on in the Big Apple. And just as her particular passion for English literature is fuelled by the very proper Mr. Doel, so too an intellectual need in him is fulfilled. While they never actually meet these two are kindred spirits and their frequent letters to one another provide each of them with something that’s lacking from their routine lives. As a kid I adored this story. It brought a tear to my eye every time I read it and now, years later, I’m happy to say that the film version still manages to do the same. Initially the book was adapted for the stage by James Roose-Evans, providing the basis for Hugh Whitemore’s screenplay which toys with the notion of the old world colliding with the new. 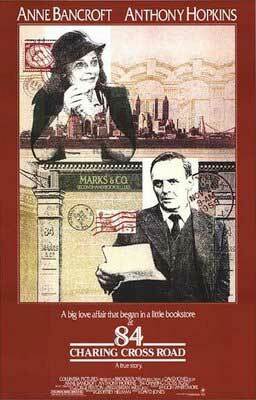 First released in 1986, the film depicts a mutually beneficial, post-war culture clash told predominantly through the protagonists’ voice-overs as we follow the posties back and forth from Helene’s brownstone apartment to number 84. Admittedly it’s not an easy task breathing life into a bunch of old letters but with such gifted performers as Anne Bancroft and Anthony Hopkins at the helm the correspondence takes on an increasingly rich emotional layer. There are also endearing supporting roles by the likes of Mercedes Ruehl who plays the upstairs neighbour Kay and under the direction of David Jones, scenes with she and Helene come across as almost improvised slices of ‘50s life. Executive Producer Mel Brooks bought the rights to the story as a present to Bancroft, his wife, and she relishes in the leading role as Hanff. Again and again we see her swilling gin and gleefully puffing on cigarettes as she bashes away at her manual typewriter, pumping out witty responses to her latest parcel of hardbacks along with further requests for more. Hopkins is a picture of modest, upright decency caught up in a less than exciting marriage with Nora (Judi Dench). The respect he shows her is quite moving but in moments of solitude he lets down his guard and betrays himself. When Helene writes that she will not be making her planned trip to London due to an enormous dentists’ bill he practically withers on the spot. Her visit was going to coincide with the coronation but, as she announces, “Teeth are all I’m going to see crowned this year”. 84 Charing Cross Road has no car chases, drive-by shootings or special effects. Nor does it contain any real drama or conflict. And yet for a bookish study in human emotions and cross- cultural connections, this film is a real beauty.